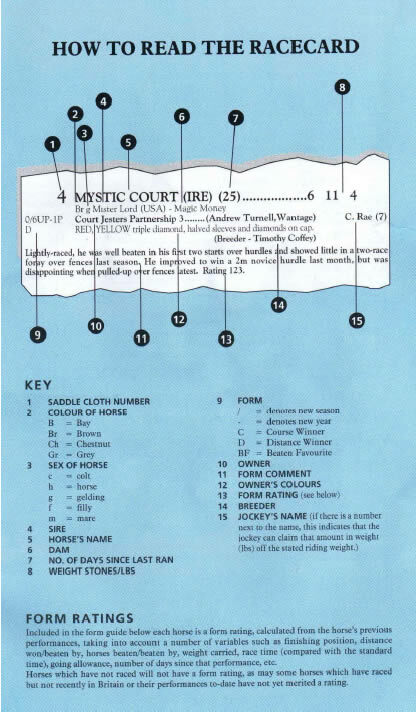 Have you ever wondered what all those words and symbols mean on a Horse Racecard? Find below an example horse racecard showing what everything means. Never again will you have to be baffled by all those numbers and letters against a horse in the newspaper! As we all know, the only way to make a long term profit from betting is to only bet when the odds are in our favour. The Value Horse Method shows you how to do just that by selecting horses that offer you tremendous value. It's very well written, easy to understand and is a real GEM of a product. I personally use the method every day of every week.